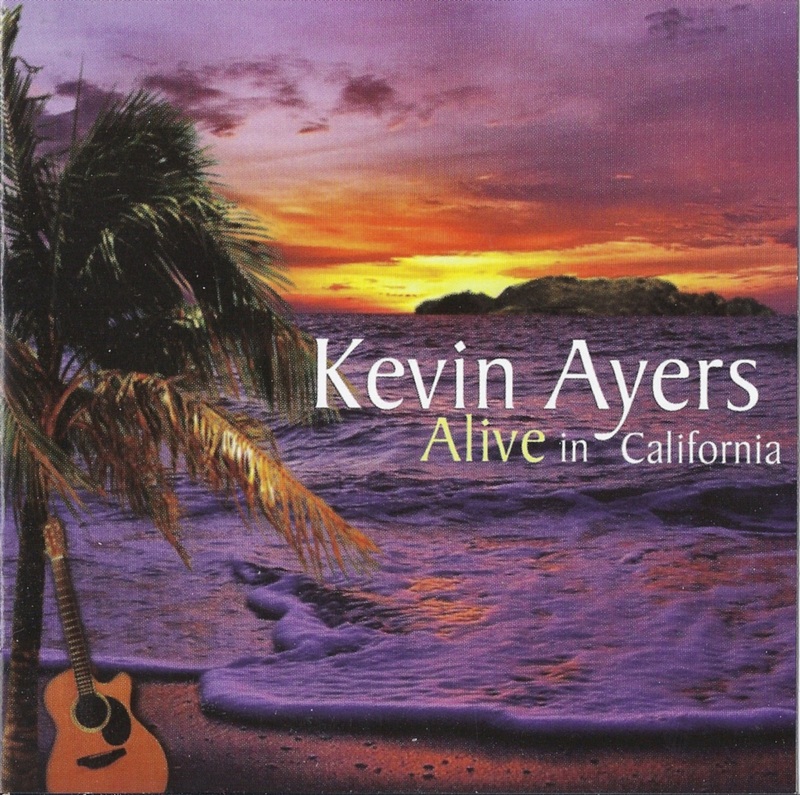 If you can find a copy of Kevin Ayers Alive in California you are very lucky indeed. We are currently trying to find someone to re-issue this album since we had an amazing email from Richard Derrick the producer of Kevin Ayers Alive in California. Richard sent us a copy of the album in April 2014, which we were extremely grateful for. The official release date was 16 November 2004. Release dates in the US are (or at least were) Tuesdays, and that year Richard’s aunt’s birthday fell on a Tuesday, so he released the CD on that date in her honor. How amazing is that? This has to be a major reason why this album should be kept on sale, it really is a priceless recording. You will not believe that these gigs were prefaced by an absolute minimum of rehearsal – in that respect they acquire a fascinating perspective to offset the other live set of 1995’s ‘Turn The Lights Down’, captured after a week of intense playing every night with the Wizards of Twiddly. Richard Derrick has chosen a personal selection of songs from 4 gigs in LA and San Francisco between 1993 and 2000. Skilfully captured on a mixture of DATs, soundboards and audience cassettes, the setlist emerges as a seamless experience with the subtleties between the different (and previous) bands a secondary factor. …Flute and sax add a welcome texture to the songs and some storming guitar work from both Ken Rosser and Victor Manning reminded me why I loved these sets the first time I heard the rough mixes. Miracles have been performed to the sound quality which literally sparkles.Kevin is on fine form throughout, relaxed and bantering with a passionate crowd who appear to be sitting on his lap in places. Spontaneity at a Kevin Ayers gig is the first ingredient we would all want and recognise – the humanity of that occasional dodgy intro or outro is a vital counterpoise to understand the magnificence of what may follow; the silence in the spaces the prelude to the genius in between. This is Kevin Ayers alive. Martin Wakeling also wrote the sleeve notes for Kevin Ayers Alive in California. Throughout 1968, a crazy dance had led Kevin Ayers across America with The Soft Machine in support of Jimi Hendrix. An endless, faceless zigzag of planes, gigs and hotels soured this ultimate rock’n’roll experience and left Ayers physically and mentally exhausted. Recovery – and the birth of a solo career- was found in a retreat back to a gentler lifestyle that has continued to exist on the border between blue sky hedonism and the darker twilight reflections that divide sleeping and wakefulness. Such escapes have punctuated Kevin’s long career like pressure valves. This early American experience would leave distinctive scars on an artist who, among the many paradoxes that mark his music and persona, is widely recognised for his perceived ‘Englishness’ and yet whose allure and sensitivities are universal. Lacklustre attempts by record companies to promote Kevin to the American public during the 1970s came to nothing, and a fleeting handful of club appearances around New York in the spring of 1980 were locally well-received, but no following momentum was sustained. Kevin maintains a consistent loathing for music’s ‘appearance business’ – the ruthless push towards a superficial, transitory commercial success; the language of ‘product’ blurring both artist and audience into an amorphous and dehumanised mass. In truth, it would be unfair to lay the entire rationale for this at the door of Kevin’s American experiences. Always happier far beyond the mainstream, his privacy largely intact, his genius accorded cult status and a large measure of artistic respect from the peers of several musical generations, the spaces between gigs grew longer and the intervals between some variable albums grew even wider throughout the 1980s and early 1990s. Those who shared the secret of his songs, those who understood that these fallen autumn leaves still glowed with the warmth of summer, feared that each rare appearance might be the last – or that the last opportunity would never arrive. Kevin Ayers did not stop. He somehow gathered the force, the self- determination, the motivation and the will to start the dance again. Old friend Archie Leggett joined him on bass for a lengthy tour of Europe. And, perhaps greatest of all surprises, as the dance came round again, ultimate salvation came from America. An invitation came via Rick Chafen of VoicePrint US for a string of dates in February and March of 1993. The deal was to comprise a series of low-key, solo club dates across the continent, travelling on stand-by airline tickets and hospitality courtesy of fans, friends and admirers. It seemed to be the ultimate challenge: Kevin had not performed solo for nearly 20 years. Yet the challenge was taken up and, in spite of a borrowed guitar with a reluctance to stay in tune, some visible nerves and fears, and a bout of illness that wiped out three gigs, the tour went ahead. The other perspective that came through to the early Why Are We Sleeping fanzine was the sheer joy from the US contingent of fans who had waited half a lifetime to see that tour announcerrfent in the newspaper. Their words became a mantra – ‘I couldn’t believe my eyes …. ‘, ‘I never thought I’d see this moment’ – and reinforced once again that the Kevin Ayers network unites a global family who need no explanations or introductions amongst each other. Perhaps Kevin laid many ghosts to rest during that solo period in America. Certainly, it kickstarted a decade of significant touring that continues to this day. Further solo US dates followed in the fall of 1993, some of which saw fellow Soft Machine and Gong friend Daevid Allen joining Kevin on stage. Returning to Europe, a rejuvenated Kevin was to link up with Liverpool acid jazzsters The Wizards of Twiddly’ for a spell. Projects also followed with the electronic Ultramarine and, latterly, the Belgian Starvin’ Marvin Band. Kevin was back in the US in May 1998 and September 2000 for the unique music you are to hear on this CD. Once again, the global family were to light the flame that brings these magical songs to life – Richard Derrick’s (Los Angeles) and Victor Manning’s (San Francisco) bands of friends rehearsed, arranged, booked venues and then played. Longtime friend John Altman just happened to be in L.A. for the Emmys at the time of Kevin’s 2000 gig, found out by surfing the Net while in his hotel room, and invited himself to sit in with the band. The lights were turned low, and the man in the black silk shirt who had permeated the soundtrack of their lives stepped in front of them and sang. Familiar Kevin Ayers, yet different. California is in these songs. The lost energy of 1968 grew beneath the sun and became golden. Thank you, America, from all of us, for rejoining the dance.